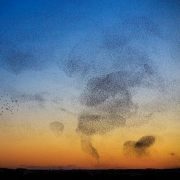 From bird flocks to fish schools, from insect swarms to cell colonies, collective behaviour is a very widespread phenomenon in many biological systems. It is hard to define, but easy to recognize. What are the mechanisms regulating collective behaviour in biological systems? In many cases collective behaviour is the result of local rules of interactions among the individuals, without any need of a centralized control. Whenever this happens, we are in presence of self-organization. It is then natural to ask: What kind of interaction rules can grant such an extraordinary coordination? The study of collective behaviour is not simply restricted to biological systems, but it has a highly interdisciplinary impact. The spontaneous ordering of spins in ferromagnetic materials is a key paradigm in statistical physics. Achieving self-organization in a group of artificial units with distributed intelligence is a crucial problem in robotics. The emergence of herding behaviour is a common phenomenon in economics, finance and social sciences too. Such ubiquity suggests that, perhaps, some fundamental aspects of self-organization are common to many fields of science. If so, the study of collective animal behaviour is not only interesting from a biological perspective, but also because the laws of animal grouping may help us understanding, and perhaps even regulating, self-organization in fields like robotics, control theory, and even economics and finance. Our aim is to understand the fundamental mechanisms of collective behaviour in biological systems through a strong interplay between quantitative empirical observations and theories. Silent Flocks: our new hydrodynamic theory of flocking (including spin conservation) has been published in Physical Review Letters as Editors’ Suggestion and it has been featured in the APS magazine Physics. We discover that in medium sized flocks no information can propagate, as both spin waves and density waves are overdamped. Focus article on Physical Review Letters: Finite-Size Scaling as a Way to Probe Near-Criticality in Natural Swarms. It has been speculated that many biological systems live close to a critical point, where they exhibit maximal correlations. Real systems in fact have finite sizes and behaving `critically’ implies that specific scaling laws must be obeyed with varying the size. We investigate this issue in wild insect swarms. By gathering three-dimensional data on swarms of midges in the field we find that swarms tune their control parameter and size so as to maintain a scaling behavior of the correlation function. As a consequence, correlation length and susceptibility scale with the system’s size and swarms exhibit a near-maximal degree of correlation at all sizes. See the Viewpoint in Physics: Insect swarms go critical. 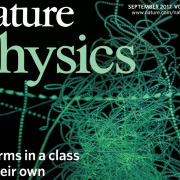 Cover paper (September issue) in Nature Physics: Information transfer and behavioral inertia in starling flocks. 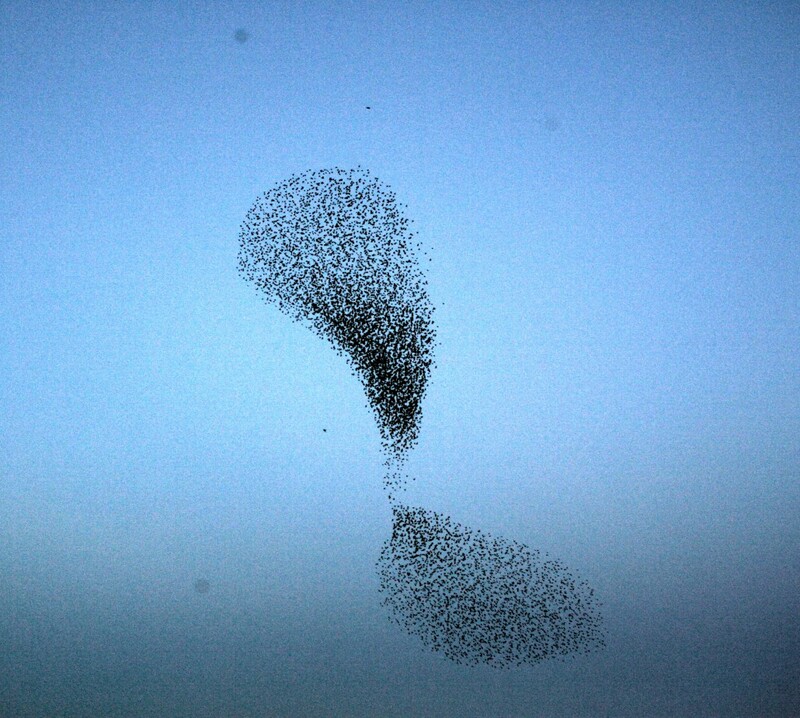 We present an experimental study of starling flocks performing collective turns. We find that information about direction changes propagates across the flock with a linear dispersion law and negligible attenuation, hence minimizing group decoherence. Building on spontaneous symmetry breaking and conservation-law arguments, we formulate a theory that correctly reproduces linear and undamped propagation. Essential to this framework is the inclusion of the birds’ behavioural inertia. Article in PLOS Computational Biology: Starling Flock Networks Manage Uncertainty in Consensus at Low Cost. We find that the reason why starlings interact with 7 neighbours is that this number optimizes the trade-off between the advantage of consensus (favouring many interacting neighbours) and the cost of keeping track of the others (favouring few interacting neighbours). Check the nice layman discussion of this paper in ‘News at Princeton‘. The original 7 neighbours result can be found here. Article in the Proceedings of the Royal Society B: Diffusion of individual birds in starling flocks. We measure how much birds move and change neighbours in the flock’s reference frame and find distinct superdiffusive behaviour. However, the diffusion coefficient is rather low, so that the structure of the interacting network does not change much in time. This may be the reason why purely statistico-mechanical approaches, such as maximum entropy, give such good results. 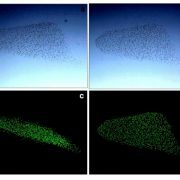 Article in Journal of The Royal Society Interface: Emergence of collective changes in travel direction of starling flocks from individual birds’ fluctuations. One of the most impressive features of moving animal groups is their ability to perform sudden coherent changes in travel direction. We show that spontaneous turns start from individuals located at the elongated tips of the flocks, and then propagate through the group. We find that birds on the tips deviate from the mean direction of motion much more frequently than other individuals, indicating that persistent localized fluctuations are the crucial ingredient for triggering a collective directional change. 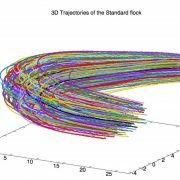 Article in Physical Review Letters: Boundary information inflow enhances correlation in flocking. The very long ranged spatial correlation functions that we found in flocks, may be due to an information transfer from border to bulk of the flock. This is a purely dynamical effect: the system seems to be always in a self-excited state, so as to maintain extremely long range correlation. Mark Buchanan, Nature Physics, ‘Birds of a Feather’ – discusses ‘active’ matter (‘…collectives of interacting and self-propelling elements with internal sources of energy.’) and the importance of modelling based on experimental data and the fundamentals of physics. Starling flocks are used as a featured example. Brad Hill (former Vice President at AOL) is a fan. Wayt Gibbs, Scientific American, ‘Insects Forgo Flocks in Favor of Swarms‘, summarizes our work on midge swarms in a 60 second podcast. This is a video illustrating life and research in our group, including AC playing basketball (truly embarrassing). Our focus is on studying the collective behaviour exhibited by flocks of starlings (Sturnus vulgaris) and swarms of non-biting midges (Chironomidae) through the analysis of synchronized high speed image sequences from three cameras. Using stereo matching and other computer vision techniques, we are able to reconstruct, in three dimensions, the trajectories of individual animals within the aggregation. Further analysis of the trajectories should lead to a better understanding of the fundamental interaction rules between individuals. More details about our computer vision and tracking research can be found here. Having completed three seasons in the field collecting flocking events of starlings (more details about the experimental setup), we have completed processing a significant number of the sessions. Using a novel tracking algorithm, we are able to reconstruct the 3D trajectories for large numbers of individuals for nearly the entire duration of an event. The two videos below illustrate the effectiveness of our tracking method. In the left panel, the raw image sequence of the flocking event. In the right panel, the reconstructed 3D trajectories of the same event. They are both best viewed in full screen mode. Collecting experimental data of collective animal behaviour in their natural habitat is a difficult and time consuming activity. The aggregations tend not to be stationary and the exhibited behaviour cannot be predicted. This is especially true for midges, as they typically swarm over a natural landmark and they are easily disturbed by wind gusts. We have managed to overcome these issues and have successfully completed two sessions of experimental data gathering (for more details about midges and our experiments). We are in the process of reconstructing the 3D trajectories for many events. Below in the left panel, is an example of a typical midge swarm event. In the right panel, the reconstructed 3D trajectories of the same event. They are both best viewed in full screen mode. 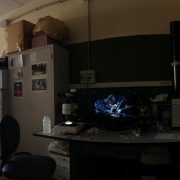 Housed in the Physics Department, Sapienza University, the COBBS Laboratory is the central hub for our research. COBBS Group photo, including ‘Big Red’ our van for experimental work. 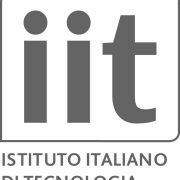 Italian Institute of Technology – Seed Project: Artswarm (2010-2013) to Irene Giardina. European Research Council, IDEAS – ERC Starting Grant n.257126: SWARM (2010-2015) to Irene Giardina. 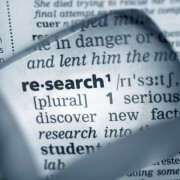 Air Force Office of Scientific Research (US) – Grant Z809101 (in collaboration with P.S. Krishnaprasad, University of Maryland – 2011-2014) to Andrea Cavagna.